Being a United States Senator from Vermont is a difficult job, but it pales in comparison to being President of the United States. As the junior senator from Vermont, Bernie Sanders has far more leeway in the positions that he can take than President Obama does. He’s not just a senator from a single state, he’s a senator (along with Patrick Leahy) from perhaps the most progressive state in the union. When it comes to assessing the wisdom or advisability of the proposed Trans-Pacific Partnership, Sanders is under far less pressure from entrenched powers than the President is. There are zero (count ‘em, none) Fortune 500 companies headquartered in Vermont. Vermont accounts for only 0.2% of exports from the United States. Take these two factors, and you put a representative in a position to truly look out for the well-being of individual workers and small businesses. Doing so is not necessarily a slam-dunk. Vermont’s neighbor, New Hampshire, also is home to zero Fortune 500 companies and accounts for only 0.3% of American exports. Yet Republican Senator Kelly Ayotte from New Hampshire has a voting record that is more conservative than that of Richard Shelby of Alabama or Thad Cochran of Mississippi. 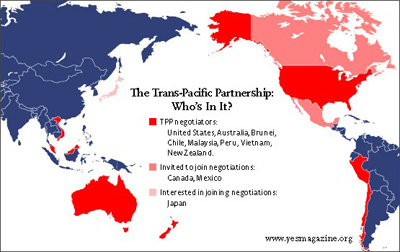 All of which is to say that a treaty of the magnitude of the TPP should not be considered cavalierly by the United States Senate. Yet this is precisely what President Barack Obama proposed and what the Senate came close to doing. Fortunately, on May 12, 2015, a sufficient number of Democrats joined with anti-Obama Republicans to forestall the Fast-Track consideration of the partnership. It appears that now the Senate will assume its normal responsibility when it comes to ratifying treaties; it will provide its advice and consent. The stakes in the treaty are just too high for any other approach. This is a treaty that presumably spans the Pacific Ocean, but does not include a country as large as and with as much international trade as China. One of the goals of the treaty is to strengthen relations between the United States and selected Pacific countries, but there is apparently little in the proposed agreement to ensure that China is not left on the outside looking in. I say “apparently” because part of the Fast Track approach has been to limit access to the actual text of the treaty. This includes Members of Congress. Sanders states that the agreement would be at the expense of workers, consumers and the environment. Supporters of these three interests represent a large piece of the pie that twice elected Barack Obama. It may be difficult to understand that the President is risking their ire and discounting their support, but the forces in the United States behind the treaty are vast and powerful. They include bankers, manufacturers of good and services that are exported, and a host of other business on America’s Pacific coast that profit from trade. These forces are doing what they would be expected to do, promoting their own economic self-interestd. Such is the nature of capitalism. And when we broaden our view to the relationship between monied interests and politics, it is no surprise that these are among the top financial backers that the President has had in his campaigns. As to why Senator Ayotte of New Hampshire looks at this and many other issues quite differently from Bernie Sanders, all we need to do is to look at her primary contributors. In many ways, they read as a group similar to the Presidents big-time contributors. Senator Sanders takes no contributions from Wall Street. In contrast, nineteen of Senator Sanders’ twenty largest contributors are labor unions. We are most fortunate to have a senator and now presidential candidate like Bernie Sanders who is not allowing the country’s largest economic interests to guide his position on an issue as important as the TPP. It’s likely that President Obama will continue to slug it out for the treaty for the remainder of his term. As with so many mysteries about his distance from progressive positions on key issues, we can only hope that when he writes his memoirs, he will let us know if he truly embraced the TPP, or if he felt that he owed it to certain interests to support it. Maybe he’ll write his memoirs during the administration of President Bernie Sanders. Next Post:He didn’t buy Obamacare. Now he’s sick, and mad at…Obamacare.